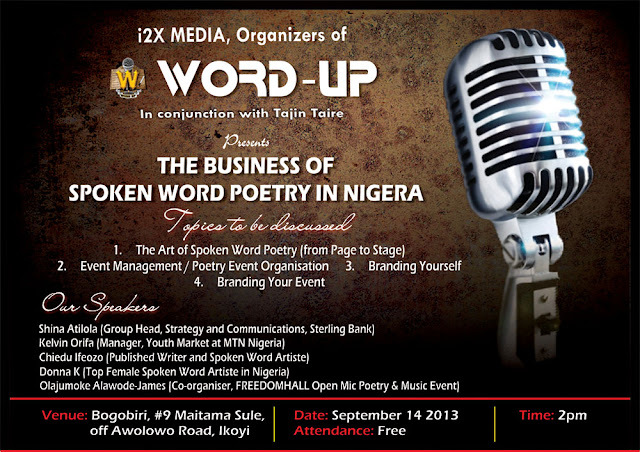 WORD UP: On September 14, 2013, she will talk on, The Art of Spoken Word Poetry. On September 14, 2013, she will talk on, The Art of Spoken Word Poetry. she will be speaking on the "Art of Spoken Word Poetry (from Page to Stage)." Donna is Nigerian - and proud of it. She is a Senior Associate in Nigeria’s leading internationally recognized law firm, “Adepetun, Caxton-Martins, Agbor & Segun” (www.acas-law.com). She is a legal/regulatory specialist with over 11 years of experience in extensive research and practice in Oil & Gas, Corporate Commercial, Labour, Property and Environmental law sectors. She is a high ranking member of the Energy and Project Finance Group of the Firm. Donna, since childhood, has had an unwavering love for the arts, winning prizes in literature and fine arts in her secondary school, Atlantic Hall Co-Educational Secondary School. She started writing her thoughts at the young age of 13 and has not stopped since then. Donna’s style of writing invokes a lot of imagery as she takes her audience on a vocal and imaginative journey through every poem she recites. She is often invited to recite poems written by other artistes who have favoured and enjoyed her creative style of delivery. Her vision is to deploy words into the conscious self of every human being; cause them to pause, reflect and adjust the decisions they make which impact on their lives and on the lives of the people around them. She believes that change comes within the individual and that if thoughts and decisions are deployed effectively, then the resultant actions would eventually permeate the moral and social fiber of a community and the world at large – one individual, one thought, one decision at a time.